ステップ・アップ・キャンペーン： 英語クラスの在校生で、4月からひとつ上のクラスに進まれる生徒さんが対象です。初月の月謝が半額となります。4月に、英語クラスから、当校のプリスクール本科に進まれる生徒さんは、入学金が半額となります。： ¥60,000 → ¥30,000. 新入生キャンペーン： 4月から当校の英語クラスに入会される場合、入会金が半額となります : ¥15,000 → ¥7500となります。プリスクール本科に入学される場合は、入学金を ¥15,000割引とさせていただきます。：¥60,000 → ¥45,000. Spring Campaigns. We have three enrollment campaigns for the new school year. Everyone is eligible for at least one. Step-Up Campaign. For students who step up in April to the next level of our English School, their first month will be 50% off. For students who transfer from our English School to our full-time preschool by April, the enrollment fee will be 50% off: ¥60,000 → ¥30,000. New-Student Campaign. 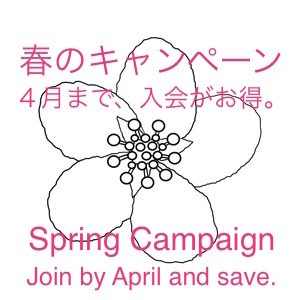 Join our English School by April, and receive 50% off the enrollment fee: ¥15,000 → ¥7500. 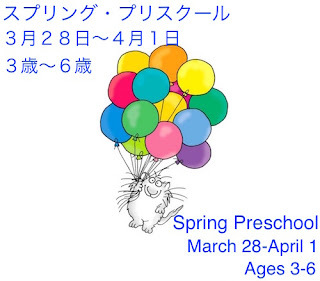 Join our full-time preschool by April and receive a ¥15,000 discount from our enrollment fee: ¥60,000 → ¥45,000. Tell-a-Friend Campaign. When you tell friends about our school, ask them to mention your name when they contact us. After they enroll, you and the new student will each receive ¥2000 worth of gift cards. The number of friends you may invite is unlimited. 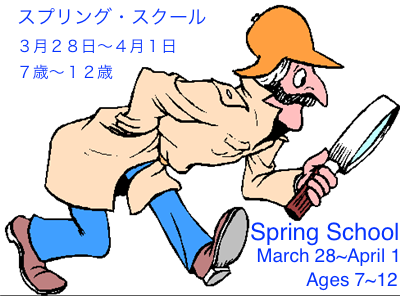 This year’s theme is “Detective!” Join us for five days of fun English study, math activities, detective projects, Bible time, and outdoor play—all in English. Dates: March 28, 29, 30, 31, and April 1 from 10:00am to 2:00pm. Ages: 7 to 12 years old. Fees: ¥24,300 for full program or ¥5,400 per day. 10% sibling discount. Apply online or submit the paper application form to the New Hope School office. Pay within one week of application confirmation to keep your child’s place. No refunds for cancellations after March 25. Bring your lunch, drink, towel, toothbrush, cup, indoor shoes, and change of clothes. Let’s have fun! *Please note that the location for Spring School is 5-1-3 Narimasu, next door to the preschool. This year’s theme is “Sandra Boynton Picture Books.” Join us for five days of stories, crafts, games, and activities—all in English. Dates: March 28, 29, 30, 31, April, 1 from 10:30am to 1:00pm. Fees: ¥14,850 for full program or ¥3,300 per day. 10% sibling discount. Apply online or submit the paper application form to the New Hope School office. Pay within one week of application confirmation to keep your child’s place. No refunds for cancellations after March 25.